You can adjust the settings forÂ your personalÂ Music Player by navigating to My Page and clicking the “Edit” button next to the Music Player. If you’d like visitors to see the playlist, you can select the “Show Playlist” option. You can also choose to always have the playlist shuffleÂ by selecting “Shuffle Playlist”. 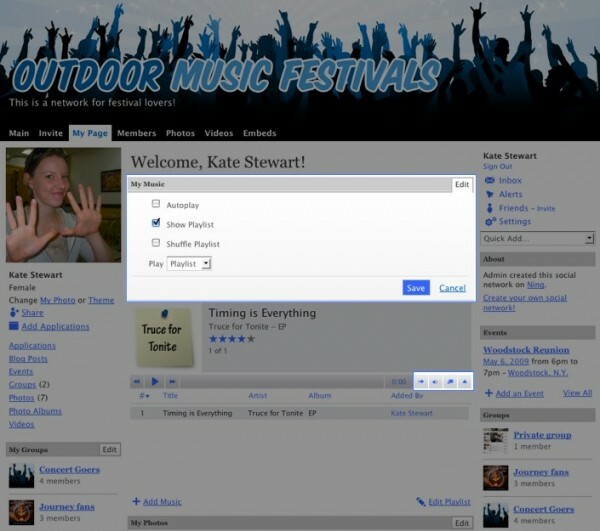 Selecting the “Autoplay” option means that your playlist will start playing automatically any time someone visits yourÂ profile page. The options on the right hand side of the control bar allow you to switch from normal playback mode to “repeat playlist” mode or even turn on “shuffle” to randomize the tracks you hear. You can also pop the Music Player out into its own windowÂ by clicking the “Open in PopupÂ Window” button so that songs continue to play while you’re browsing the Ning Network!